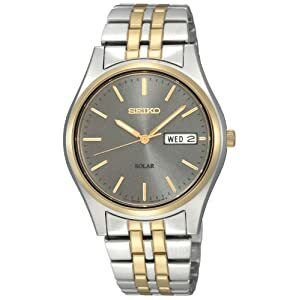 This solar powered, two-toned (silver and gold) dress watch has a stainless steel case and bracelet. The charcoal dial with gold hands and hour markers provide high contrast for easy readability. The date and day are located in the customary 3 position. The solar cells can get power from all kinds of light - not just from the sun. This watch has a water resistance rating of a mere 30 meters (99 feet) - do your best to keep it dry! Overall it's a handsome watch at a decent price.